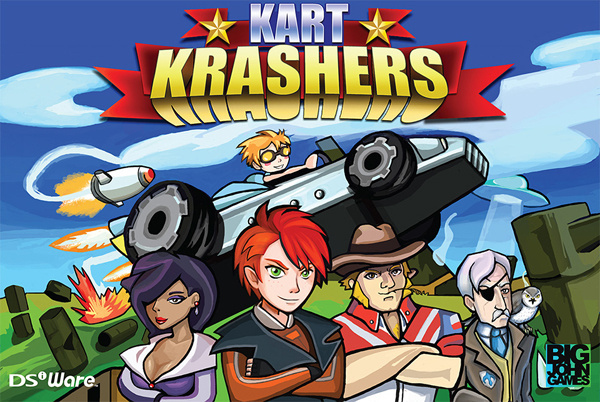 Big John Games' Kart Krashers is speeding onto DSiWare and the 3DS eShop later this summer. Unlike many kart racers it's a single player affair; your aim is to charge through 10 courses looking for stars and smashing up any obstacles in your way. Grab enough points and you might just earn some Golden Wheels. Check out the first trailer below. Will you be attempting to become the Kart Krashing champion? Ken Patterson, President of Big John Games, is excited to notify you that our vehicle platformer game Kart Krashers has been submitted to Nintendo and will be available for download on the Nintendo DSiWare™ service and in the Nintendo eShop on Nintendo 3DS™ later this summer. Kart Krashers has been a labor of love for the team at Big John Games. “I am extremely proud of what we have accomplished and how fun we have made this game.” stated Patterson. Kart Krashers is a single player game where the player drives their kart through an exciting 10 stage circuit that spans the globe, and beyond! Each stage has three uniquely laid out events, for a total of 30 challenging competitions. The goal is simple: collect stars and smash into objects to achieve the highest event score. Earn enough points and you will win up to three Golden Wheels in each event, which are the key to advancement in the Kart Krashers competition. The competition starts with a team of two drivers. Emily Prix is a young girl that can fix just about anything, and who needs the Kart Krashers prize money to help her struggling family. Cross Ranson is a talented and motivated driver with attitude and a flair for danger, but is plagued by a mysterious curse that can only be broken by winning the Kart Krashers competition. Throughout the course of the circuit you will meet up with three new drivers, each with their own motivations, and each bringing new Kart capabilities and driving styles to your team. Earn enough golden wheels and your team will win the grand prize, and the honor of being known as Kart Krashing champions. There are achievement medals to be won, and high scores to be set. Prepare for Kart Krashing action later this summer! Meh, I'll pass. Guess that ends our streak of good DSiWare titles. This looks... not so good. Gee, I wonder who's reviewing this? I haven't had a reason to comment for a while... But this game merits me saying, "Dang. This looks really friggin bad." It looks cool for an DSiWare title. I like the comic art and it seems the game is a blast since it combines a platformer with a racing game. I like both genres so I will definitely ckeck out this one! @TheSeoulTrain Thanks for pointing that out. I don't think it looks bad. I will be getting this game. I like racing games. I'm going to stick with Mario Kart 7. Maybe I'll pretend to have this by doing Balloon Battle or Coin Battle modes. Frankly I am surprised at the lack of quality in this title. Thorium Wars looked really good for a dsiware game. It might look a little bad off, but that don't mean its not fun! I'll let ALL the reviews roll in before deciding on purchasing, though. DSi Ware game of 2012.